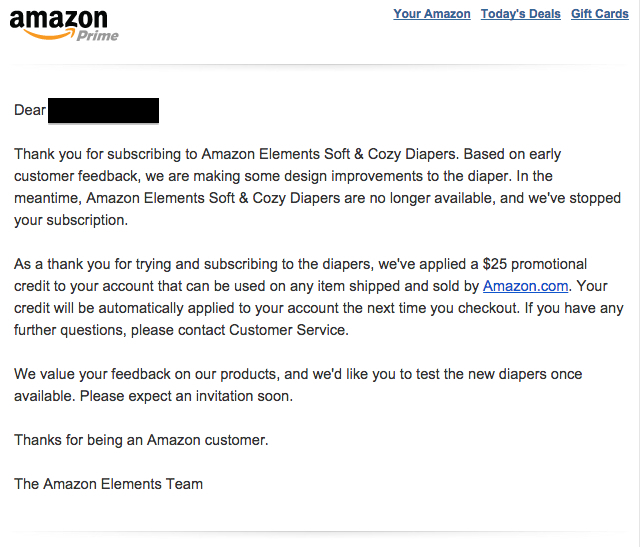 Amazon has yanked the “Amazon Elements” diaper brand it launched for Prime members just six weeks ago, saying that it is working to improve the diapers’ design “based on early customer feedback.” The company emailed customers on Wednesday and has removed the diapers from its website. The diapers got mediocre reviews on [company]Amazon[/company] — when I looked at them recently the average was hovering around 3.5 stars out of 5. I tested the diapers and found them to be okay, not great, and particularly disliked their sagginess and cheesy graphics. Tricia Duryee at Geekwire has a much more thorough review of the old diapers here.